From Goodreads.com: Already widowed by the age of forty, Ilka Nichols Jensen, a school portrait photographer, leads a modest, regimented, and uneventful life in Copenhagen. Until unexpected news rocks her quiet existence: Her father–who walked out suddenly and inexplicably on the family more than three decades ago–has died. And he’s left her something in his will: his funeral home. In Racine, Wisconsin. 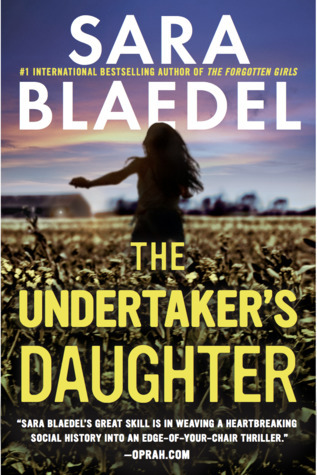 But when she stumbles on an unsolved murder, and a killer who seems to still be very much alive, the undertaker’s daughter realizes she might be in over her head . . This is my first time reading anything from this author (although I have two of her other books from a different series currently sitting in my to-be-read pile). To be honest, I wasn't sure what I was expecting with this novel, however all things considered it was a bit of a disappointment. I found the author's writing style to be strong – which was a definite plus – however the mystery fell flat, and the main character was very unlikable. To be honest, I couldn't really become invested in much of this due to Ilka and her behavior (which honestly would have made much more sense if she had been a much younger woman and not a 40 year old one). There were also some pretty big issues that Ilka as well as the funeral home needed to deal with that were never solved in any sustainable way. Sure, they managed to deal with the IRS problem, but that was just the tip of the iceberg. The mystery aspect of this story is what kept me reading, although it wasn't what I would call a thriller. The biggest turn off for me is the fact that this novel ends on a huge cliffhanger. And while the cliffhanger by itself was enough to somewhat pique my interest, I will have to see if her other books are any better before I commit to reading another from this series. All things considered, I am sure there are still plenty of people to which this novel will appeal. I will give this author (if not this series) another chance.